Since 1961, the Wellborn family has owned and operated Wellborn Cabinet, Inc., located in Ashland, Alabama. Wellborn offers 6 product lines: Home Concepts, Select, Premier, Estate, Elegant Bath and Wellborn Closets. The Estate Collection offers the “You Draw It” program as an option. This program is designed to help you bring a cabinet concept to creation. Estate and Elegant Baths both offer “ColorInspire” as an option, which offers you the ability to choose from thousands of finish colors from every major paint manufacturer. 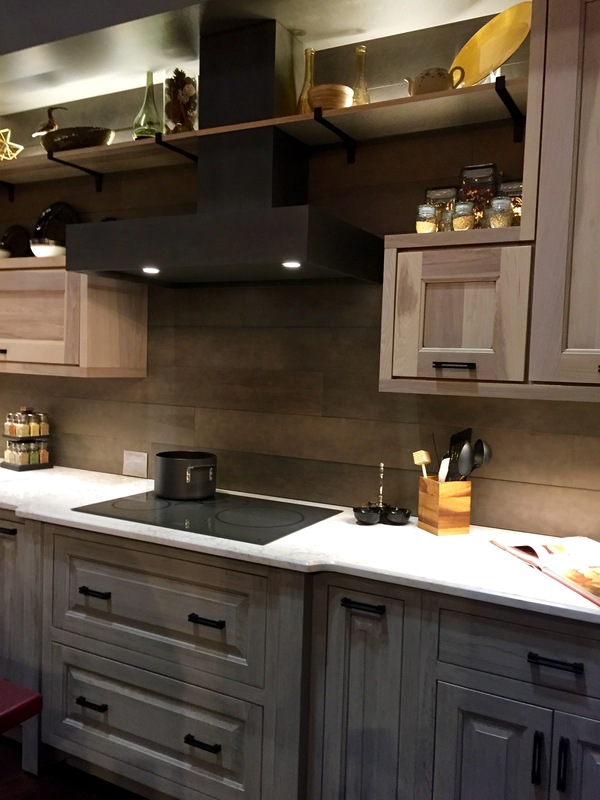 A new offering is the Nature Collection which is a new line of gray paints and stains – available in one stain option and two paint options and showcases the rising popularity of gray cabinets over the last few years. Loved all the features inside the drawers including fitted spaces for pots, pans and cannisters. 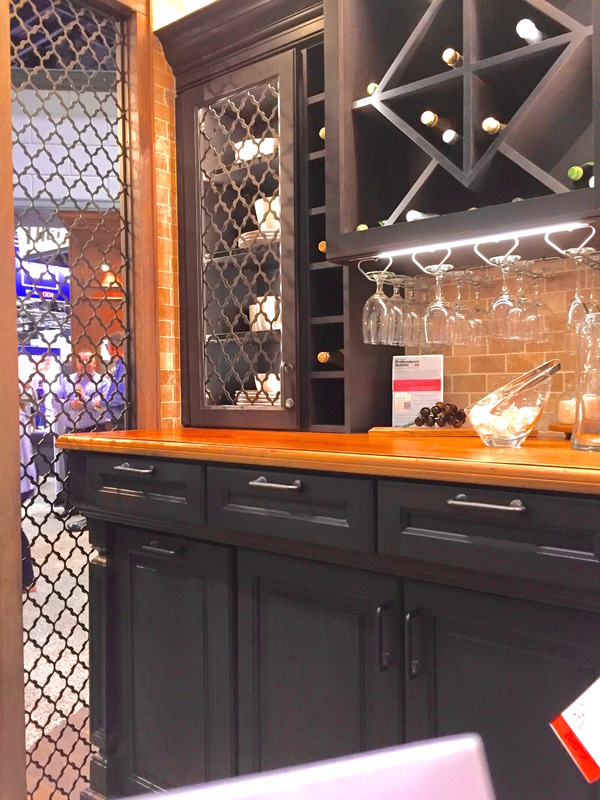 This traditional style entertaining serving station was a feature at the Wellborn booth at KBIA. Available in the Select Series, this vignette features a Bedford Square door style in Cherry with a Shadow stain and Charcoal glaze. 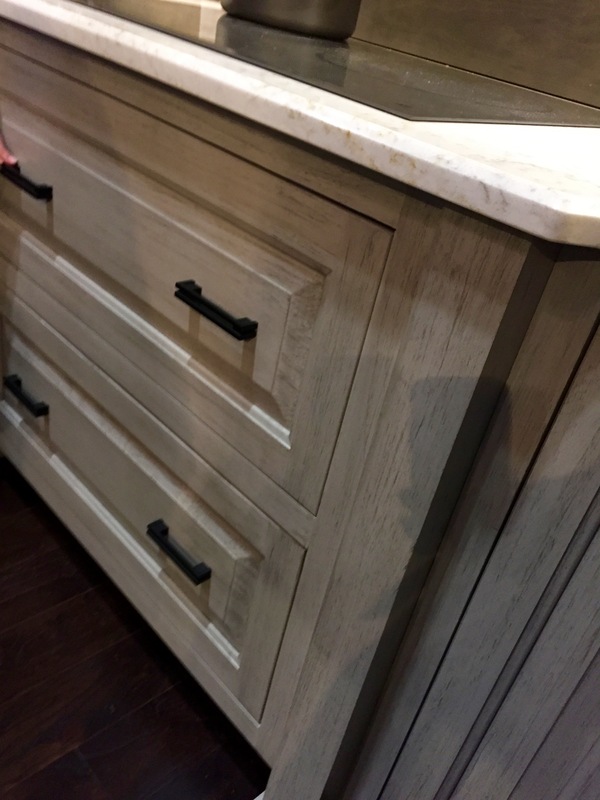 The breakfront detail on the countertop was created using Furniture Drawer Units and Crown Molding to provide an extra layer of detail. The beautiful Classic Decorative Legs were added to complete the traditional look on the lower half of this vignette. As your eye is drawn to the detail above, take note of the Decorative Door Frames outfitted with custom stainless metal inserts. One thing the Wellborn booth did a great job of showcasing is how far a little creative thinking can take us. Below we see a pet bed and feeding station that was created by using the cabinetry usually used to house wall ovens. Wellborn introduced their “Modern Minimalist” design at the show and we were all really impressed with the side pull-out mirror. 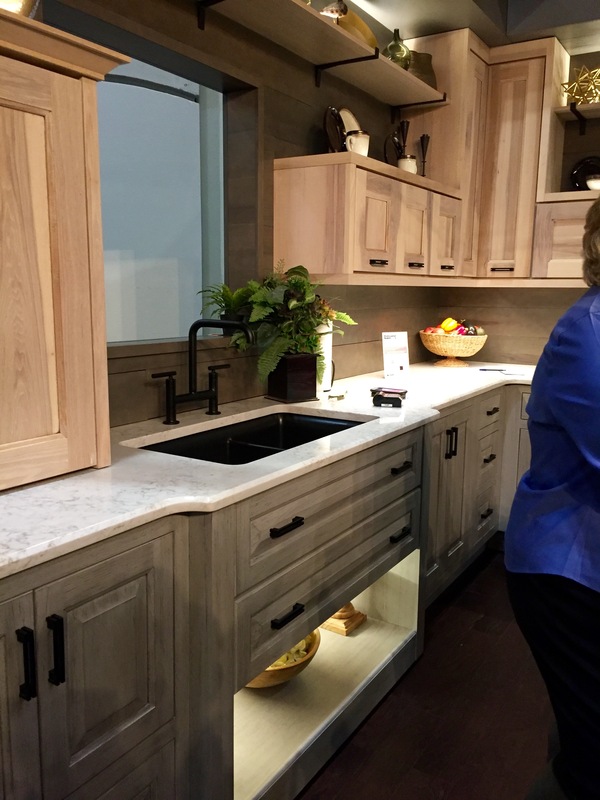 My dear friend Gloria Graham Sollicito of Artful Kitchens in Florida and new friend Claire Jefford of Creating Contrast Designs in Canada reviewing the Wellborn offerings. 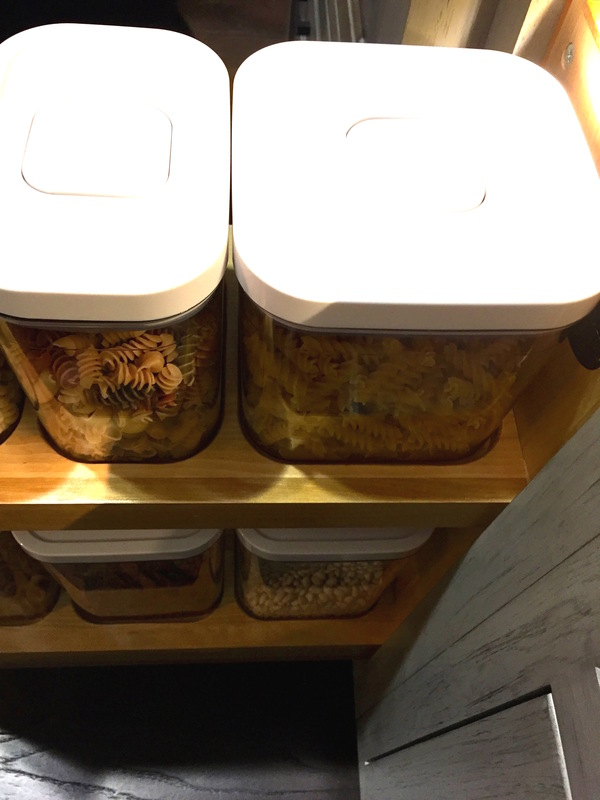 A real showstopper is the Modernistic Butler’s Pantry. 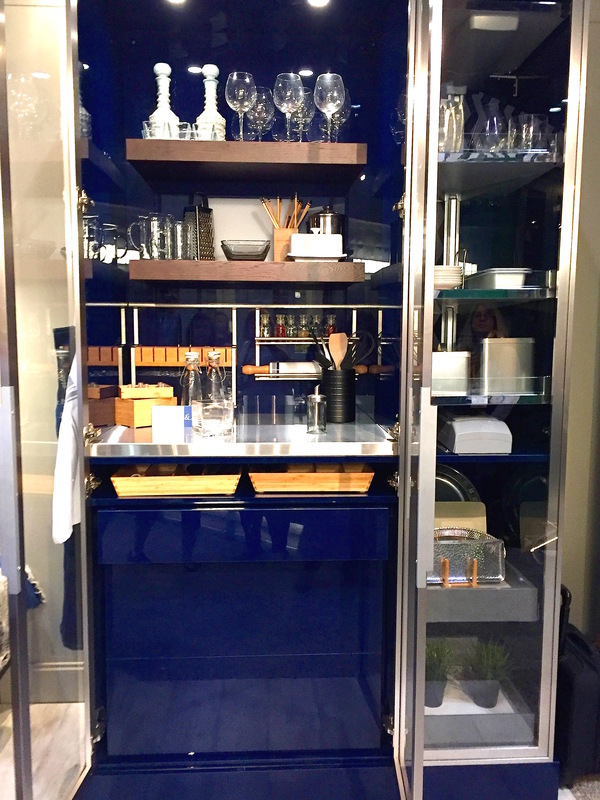 The Butler’s Pantry features Midtown Gloss Marine in the exterior and interior. You Draw It medal doors were added to provide the modernistic feel. 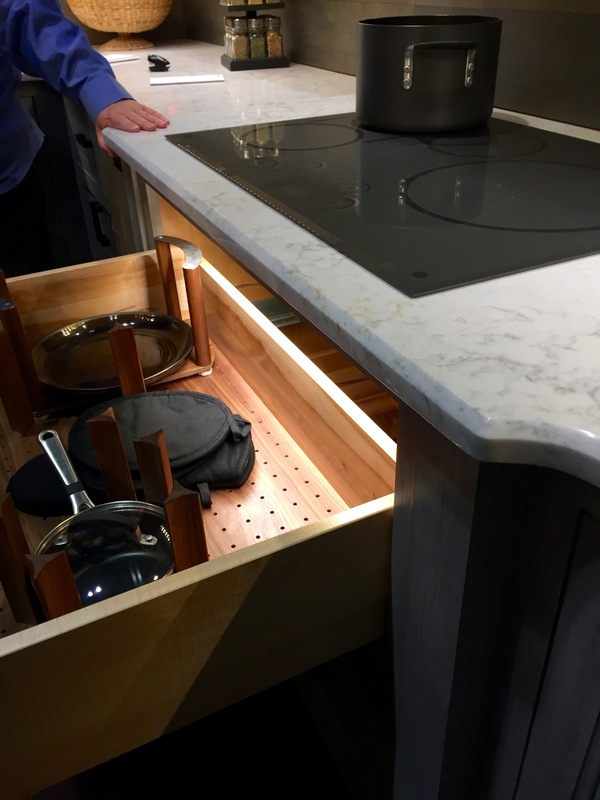 A stainless-steel countertop was fitted as well as many accessories to provide better use of the available storage space. 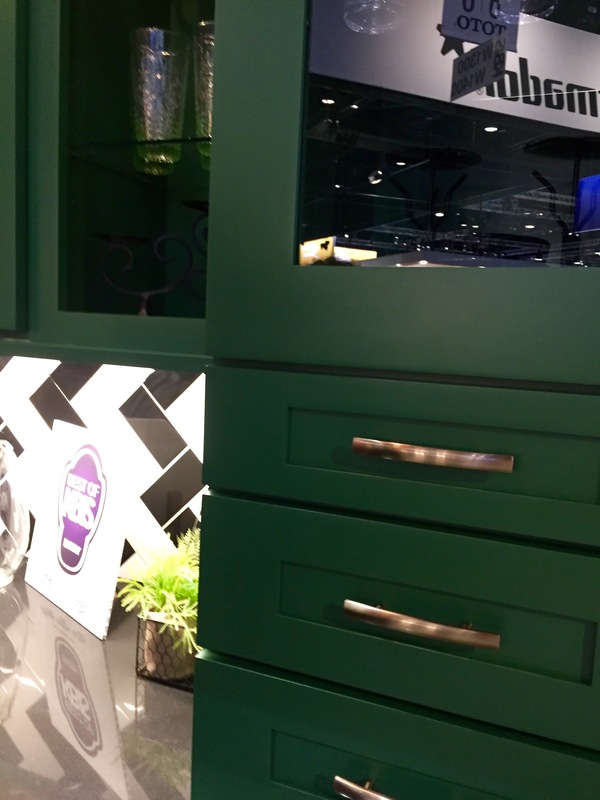 A heartfelt thank you to the folks at Wellborn Cabinets for being a sponsor of #BlogTourKBIS and to Modenus, the power behind BlogTour for inviting me to participate! My participation was sponsored in part by Wellborn. The products featured here are of my own choosing and my opinions are my own. All photos by Linda Merrill for Surroundings, except where noted. Love the green in that first pic!